The EHM VITA water Ionizer/alkaliser makes electrolysed reduced antioxidant water also called KANGEN water with excellent hydrogen levels. With 7 plates and 150 Watt (low energy consumption) the ionizer has a Hi-Tec SMPS system, works fully automatic, is computer controlled and has a self cleaning function. 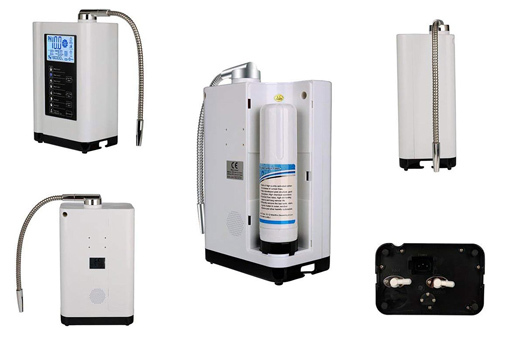 It does all the main processes of a water ionizer. It is simple to operate ! The Vita has a unique life measuring of the actual pH and ORP levels (=Oxidation Reduction Potential) ! This enables the user to see the real level of pH and ORP and by choice can adjust the flowrate/minute. With this feature it is also possible to additionally increase or decrease the pH and ORP levels. Acidic: 2 levels: pH 3 to 5.5 depending on mineral content and flow rate. ORP: up to -850mV potential increase, depending on mineral content and flow rate. Automatic Self cleaning: The machine will self clean periodically to ensure optimal performance and long life of the electrolytic plates. Filter life for inbuilt filter: 3000 litres or 6 months for a household of 4 person, depending on usage. Installation is a breeze. You can do it yourself! It's very simple and installation instructions are included. The faucet diverter (Tap connector kit is included) attaches to the outlet of your sink faucet. For operating the ionizer you turn on the cold water at the sink-tap and then flick the lever of the tap connector horizontally. Water will now flow through the ionizer and will automatically turn on the ionisation of the ionizer. When the water is needed through the main sink tap for doing dishes etc then the lever is moved into vertical position, as the photo shows. Drain water: The VITA ioniser has a special tube that directs acidic drain water. It can be collected or drained into your sink. Alkaline water: The alkaline water flows through the stainless flexi-hose. The flexi-hose has the advantage that it can be readily moved into many directions and heights to fill jugs, pots and bottles. Warranty: 1 year Ionza Warranty - parts and labour. Additional warranty can be purchased for up to 3 years in total. See order details ! Freight and Free Delivery: Ionza offers free delivery only in New Zealand. For international orders Ionza will invoice freight separately. Ionza has been distributing Water ionizers for over 11 years. 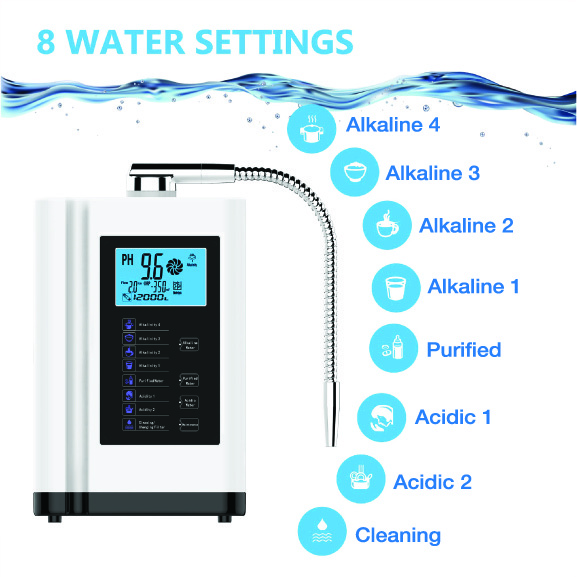 "When we first were introduced to alkaline water the price of the machine were very expensive until I started to do research and found your company. Since drinking this water, my health has improved – as in I no longer have to take any medication for my arthritis. It helped me to keep me more relaxed and not stressed out like I was before. It is very pleasant tasting. It keeps my 80 year old mother’s blood pressure steady, and it has helped drop my cholesterol level, and my mothers. I definitely would recommend an ionizer to other people and have done so by sharing water to other people. Why – because they have seen the improvement in my heath and well being. You supply excellent customer service. Thank you as it has changed my life." 3) water taste noticeably better. Taste "sweeter". I don't know how to describe, but I definitely find drinking the ionized water more enjoyable and easier for me to drink more. 4) I seemed to have more energy (able to focus more). The CE marking (also known as CE mark) is a mandatory conformity mark on many products placed on the single market in the European Economic Area (EEA). 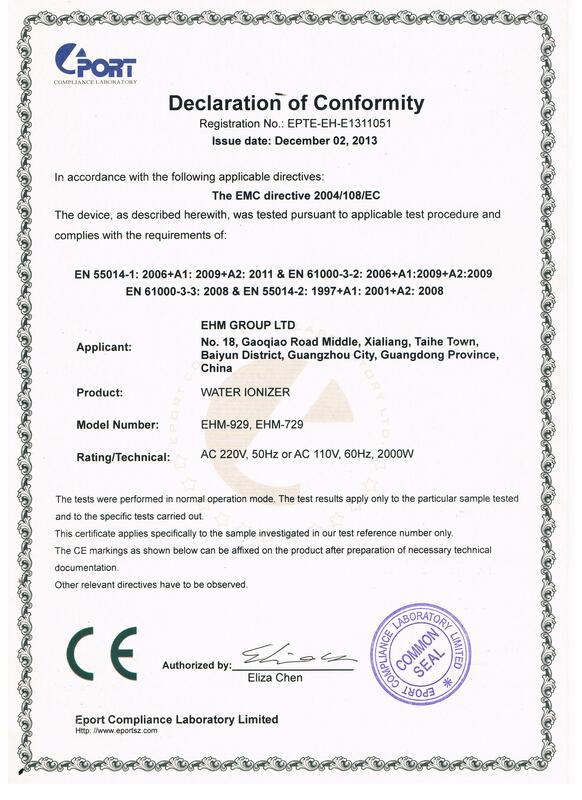 The CE marking certifies that a product has met EU consumer safety, health or environmental requirements and EMC issues. 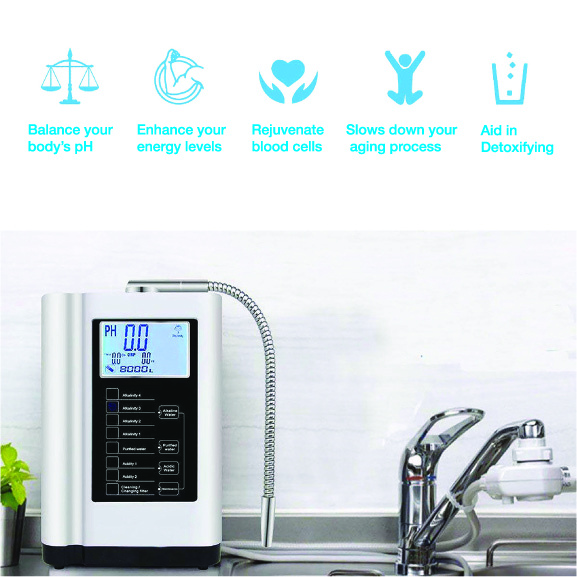 Click the button below to add the EHM VITA - 7 plate Alkaline Water Ioniser - SPECIAL to your wish list.